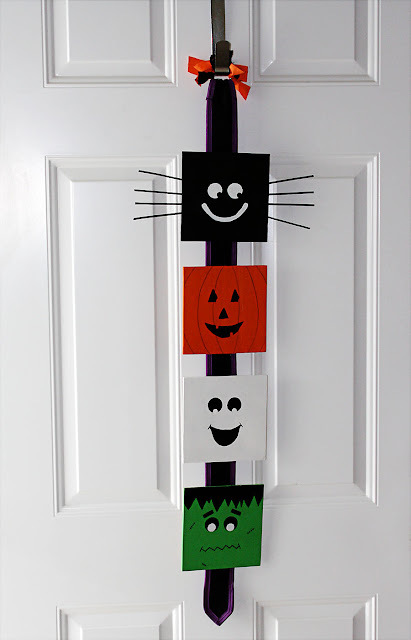 I've been trying to make decorations for our front door for the different holidays this year and sadly have only successfully made one for Easter, well and now Halloween. I got the idea from this blog. She used coasters and ribbon to make hers and I didn't have either of those, but was determined to make it without spending anything. I ended up cutting some thin wood leftover from another project and painting it. I actually free handed the faces (which I never do because I'm a perfectionist) and it took a lot for me to do that. I used some bamboo skewers for the spider legs, because I couldn't find any dead twigs. When it came time to glue it all together I realized I didn't have any black ribbon so I used some black flannel with interfacing between it and a D-ring for the hook. I'm really happy about how it turned out and the best part is that it didn't cost anything.